The Book of Eli (2010): The morning after The Book of Eli was released, I awoke to find two separate text messages on my phone asking me if I had seen it yet. Guess it was urgent enough to text me after 11:00 pm. Over the course of the week, numerous friends and family were openly curious as to my opinion on the post-apocalyptic action flick. A star-filled Hollywood production about the Bible? Denzel Washington and Gary Oldman? It's a film that should be right up my alley, right? So why do I have such mixed feelings? Probably because The Book of Eli is such a mixed movie. Part popcorn action film, part philosophical treatise, it feels a bit like The Road meets The Road Warrior. A lone sojourner walks the burnt earth with purpose. Much like Abraham in Genesis, Eli (Washington) is a man of faith commanded by God to go to a promised land that will be revealed. (Actually, we don't really know Eli's name; the only clues are the film's title and a grocery story name tag pinned to the inside of his bag.) Walking westward for 30+ years, he hasn't found that land yet. So he keeps walking, eventually wandering into a small town run by Carnegie (Oldman). The film, up until this point a quiet look at a lone traveler, suddenly jumps into spaghetti western mode, including lots of unbathed baddies, a bar fight, and a shootout. Carnegie wants the book Eli has been carrying all these years. He's the cliche crazed antagonist with the big bald henchman surrounded by scruffy underlings, and he'll do anything to get that book. Mila Kunis portrays his stepdaughter who is intrigued by the strength and faith of Eli. Together they try to fulfill the mission God gave him years ago and, in essence, save the world. The world of Eli is harsh, filled with marauding gangs and a lack of resources. Shot in stark yellows and ashen earth tones, you get the sense that everything in this world is sun-worn and decaying. There are a lot of slow-motion scenes and far more dialogue than I expected. When the action appears, it is swift and violent. Eli dispatches his enemies with effortless precision, almost as if it were more an inconvenience than a battle. A shootout in a farm house employs some interesting panning shots between Carnegie's men and Eli & company. Most impressive is the soundtrack, adding hauntingly intense tones to every scene. 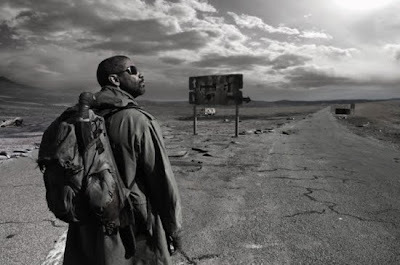 Theologically, I can't fully discuss The Book of Eli without giving away the twist ending--though if you're familiar with the Old Testament, you may already have a pretty good guess. About the ending: the film could have concluded about 15 minutes sooner and it would have been better for it. The final moments nearly ruined the entire film for me as it takes the story arc on a bizarre tangent and never looks back. But one theme is worth pointing out: how we view the Bible. Carnegie views Scripture as a weapon to use to control others, an authority to be used as he sees fit. We would all condemn this kind of megalomaniacal behavior, yet how often have we twisted or ignored the words of Scripture in order to have control of our own lives? Carnegie's behavior is nothing new; its severity only reveals humanity's depraved tendencies. On the other hand, Eli views the Bible with a sense of awe and respect. This is a book to be both studied and lived out; he regrets later not always living out the words he knows so well. Both men view the Bible as important, but for entirely different reasons. Yet by the end of the film, we're left with a vague message that the Bible is an important book not for its truth and ability to transform our lives, but for its historical and cultural significance. Yes, the Bible is a historically significant piece of literature; yes, it has the capacity to guide and define culture; yes, it is the one of the most beautiful and powerful examples of the written word. But it's so much more; it is God's Word, revelation of His heart and plan for the redemption of creation. Its importance and truth is not in and of itself, but because of the Person it is about. My final concern: would God, in a post-apocalyptic scenario or otherwise, empower and command His chosen follower to brutally kill people who stand in his way? Is this the way of Christ? Is this something we should celebrate? Eli doesn't, but he also doesn't appear to grieve his actions. In a world void of hope, when one man holds a book filled with the hope and love and compassion and grace of Christ, does that message get tarnished when it is sent via bloodied machete? Thus, my mixed feelings. This is neither a great nor a terrible film; it also doesn't succumb to mediocrity. The Book of Eli is entertaining and thought-provoking and has the Bible in it. I'll simply leave it at that.